How lucky am I? I have just experienced three days of nail biting intensity (also a little bit of chocolate biting) while viewing the World Chocolate Masters competition in Paris. I had an amazing opportunity to not only walk through the competition area for an intimate view of the competitors, but I also tasted my way through 20 of the world’s best chocolatiers and pastry chef’s creations. 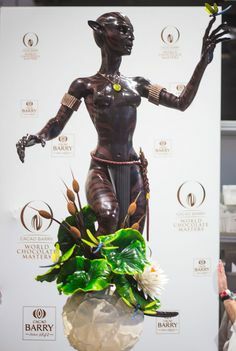 The World Chocolate Masters is a unique international competition that is solely focused on chocolate in every category. The competition is run by French chocolate brand Cacao Barry and is one of the few international competitions that is an individual event and not a team event. The final in Paris had 20 competitors from around the world. A chocolate sculpture embracing the theme. All the individual elements for the showpiece can be pre-made but not joined. Competitors had the opportunity to design their own chocolate mould fitting with the theme and create a moulded chocolate live during the competition. A sweet takeaway item made live. The competitors also had to design and print their own packaging to present their snack in. Prior to the competition commencing all competitors were flown to Paris to design and create their own chocolate from the cocoa bean that was presented at the competition to a panel of expert judges. This chocolate could also be used in any of the competitor’s products. The patisserie of the day must contain at least three different textural elements and have an explicit chocolate taste. Patisserie of the day is a fresh and delicate pastry which is meant to be displayed and made “à la minute” or fresh each morning. A traditional example of a patisserie of the day might be a Saint-Honoré, Millefeuille or Éclair. A broken white bird cage supplied by the organisers was the base to be used for a small chocolate showpiece. Adhering to the theme, competitors were asked to build a chocolate showpiece utilising the bird cage as a base. wear the title of World’s Best Chocolate Craftsman. He gets the unique opportunity to visit a cocoa plantation and his work will be displayed in the world-renowned Harrods department store in London. Hinashi Onobayashi from Japan and Marijn Coertjens from Belgium were awarded the silver and bronze medals. Australia will be holding the World Chocolate Masters national selections at Crown Casino on the 26th of June 2016. For expressions of interest or to receive an entry form please contact Kirsten Tibballs via the Savour contact us page. This entry was posted in News and tagged baking school, becoming a chef, cacao barry, callebaut, cooking classes, cooking classes melbourne, cooking course, cooking courses, cooking school, culinary arts, kirsten tibballs, pastry chef, pastry courses, pastry school, savour chocolate and patisserie school, savour school, top culinary schools, world chocolate masters on January 20, 2016 by Kirsten Tibballs. Three master chocolatiers, Rebecca Carins of Savour Chocolate & Patisserie School in Melbourne, Elicia Chan and Sassi Matteo competed on Sunday, May 25 for the opportunity to represent Australia at the World Chocolate Masters next year in Paris. Visitors watched in awe as the entrants created individual chocolates, an entremet and a chocolate sculpture around the theme “Inspiration from Nature”. These products were created in eight gruelling hours of competition organised by Australia’s ‘Queen of Chocolate’ Kirsten Tibballs and proudly presented by Callebaut and Cacao Barry. Arriving at 6am to begin judging the contenders were Kanjiro Mochizuki from The Imperial Hotel Japan, considered one of the world’s leaders in sugar work and has served on the jury of the National Pastry Team Championship and Coupe de Monde in Lyon. He was joined by Adriano Zumbo of Adriano Zumbo Patissier, and Deniz Karaca, who was placed third when he competed in Paris at the World Chocolate Masters 2013. Unusually warm weather in Winter saw contestants swelter in the Hordern Pavillion, not at all ideal for chocolate. Unfortunately for Sassi, the heat caused his showpiece to welter and fall. Fortunately, he made a miraculous recovery and was able to finish his chocolate showpiece in time. It was Rebecca Carins’ who withstood the heat of the competition and took out the major prize, a Robot Coupe Blixer 3 and the opportunity to compete in the Asia Pacific World Chocolate Masters Qualifier in Taipei. As runner up, Elicia Chan won a trip overseas to Taipei to watch the Asia World Chocolate Masters Qualifier. For third prize, Sassi Matteo won a class with 2013 World Chocolate Masters Champion Frank Haasnoot at Savour Chocolate & Patisserie School. Rebecca’s remarkable chocolate showpiece is now on display at Savour. Stay tuned for more on Rebecca’s journey to Taipei. This entry was posted in News and tagged adriano zumbo, bean to bar savour, becoming a chef, best chocolate, cakes, callebaut, callebaut chocolate, chocolate, chocolate showpieces, chocolates, cocoa barry, cooking classes, cooking classes melbourne, cooking competiton, cooking school melbourne, culinary schools, deniz karaca, entremets, Kanjiro Mochizuki, kirsten tibballs, melbourne, savour, savour chocolate, savour chocolate and patisserie school, savour school, top culinary schools, world chocolate masters on June 2, 2014 by SavourSchool. Entries Open for World Chocolate Masters Australian Qualifier! 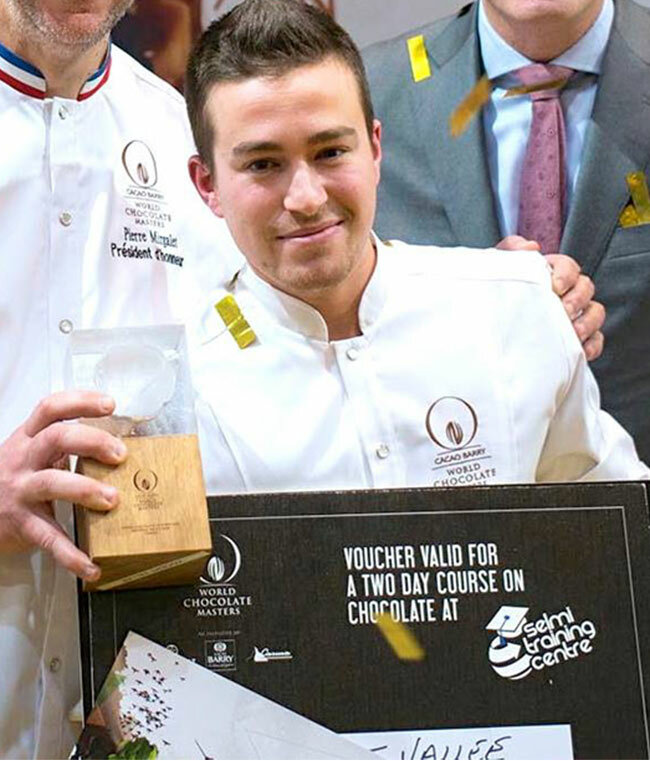 Every dreamed of winning the World Chocolate Masters in Paris? This could be your moment! Entries are now open for the World Chocolate Masters Australia Qualifier with the theme just announced in Paris: INSPIRATION FROM NATURE. Nature proofs to be a strong source of sensorial inspiration. Whether it is the colour of flavors, the sounds of the ocean, the change of seasons, nature is all around us and affecting our moods. At the same time we want more pure, authentic and high quality ingredients. For us, food is more than just food. For the 6th edition of the World Chocolate Masters, Pâtissiers, Chocolatiers and Chefs will have to play with colours, shapes, scents, textures…to tickle Jury’s senses. We like to invite chocolate creators around the world to explain us how natural products are shaped and transformed into a delightful story with cacao and chocolate at the heart. This entry was posted in Competition, News and tagged callebaut, callebaut chocolate, chocolate, chocolates, cocoa barry, cooking classes, cooking classes melbourne, cooking competiton, cooking school melbourne, kirsten tibballs, melbourne, savour, savour chocolate, savour chocolate and patisserie school, savour school, world chocolate masters on February 14, 2014 by Kirsten Tibballs. Asia Chocolate Masters – Deniz Karaca of Australia wins! Australia has done it again; first place in the Asian World Chocolate Masters selections for the second time in a row. After being awarded first place at the national qualifier in Australia last May, Deniz Karaca from Epicure catering in Melbourne, has been training tirelessly to prepare for the Asian WCM qualifier recently held in Taiwan. At stake, the top two countries would qualify to compete in Paris at the World Chocolate Masters. With the theme ‘Architecture of Taste’, competitors were challenged to create a chocolate show piece, two identical chocolate gateaux, 40 moulded chocolates and a reinvention of the classic mille feuille. The jury panel and audiences were fascinated by Deniz’s showpiece which captured the essence of the competition theme. ‘Just like a building or a bridge, taste has its very own architecture’ says Deniz, when asked about his showpiece creation by the jury panel. ‘For a building, its strength is measured by the way it is put together just as much as what elements where used to build it, such as wood, stone or steel. The same principal can be applied when creating flavours’. Going into an international competition, judges genially have no expectations regarding Australia, which is a good thing, as we can fly under the radar a little bit. They are mostly drawn to the countries that have dominated for decades in chocolate and patisserie such as France, Belgium and Switzerland. These countries have already established a fierce rivalry, and judges are often very critical, searching long and hard for an opportunity to mark then down. Deniz’s work, however, was a stand out in the Asian competition, with the judges impressed by his innovative creations. The top two in Asia were Australia and Macau, both winning the chance to compete in the World Chocolate Masters in Paris. For his achievement, Deniz also took home a Kitchen Aid stand mixer and won the honour of designing his own chocolate mould by Chocolate World, the leading chocolate mould manufacturer in Belgium. Deniz now has the monumental task of training for the WCM held in Paris on the 28th and 29th of October this year. He will now compete against 20 of the leading chocolatiers and pastry chefs from around with the world to try and secure the title of World Chocolate Master 2013. This entry was posted in News and tagged belgian chocolate, callebaut, callebaut chocolate, chocolate, chocolate callebaut, chocolate showpiece, deniz karaca, entremet, epicure, paris, pastry chef, world chocolate masters, world chocolate masters 2013 on September 18, 2013 by Kirsten Tibballs.